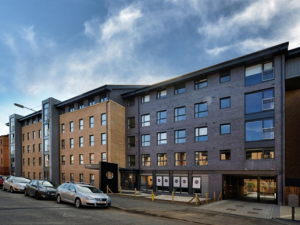 Student Accommodation has transformed this key location on the corner of Argyle Street and Kelvinhaugh street. The new Student Residences comprises of 28No. Studio Flats and 39No. Cluster Flats, each with 4, 5 or 6 bedrooms with ensuite and shared kitchen facilities, the accommodation is spread over ground to fifth floors with the total quantity of bed spaces being 231. All of the blocks have the same architectural language which is classical in nature with strong cornice lines at Ground, First and Third floors with the upper floors differentiated with a change in colour and cladding detailing. The cornice lines break up the vertical panels which sit between the regular grid of windows. The central amenity area landscaping is a result of the underground railway tunnels which bisect the site. This constraint has provided the opportunity to create a landscaped area which work in tandem with the student accommodation itself.